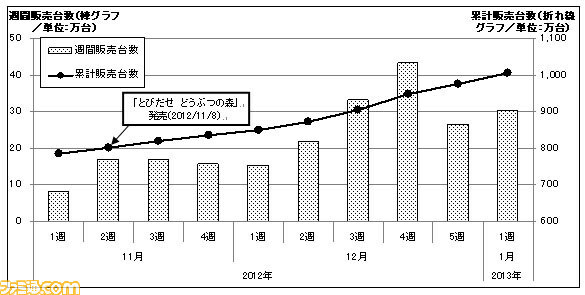 As of January 6, 2013 Nintendo has sold 10,068,192 Japanese units of the Nintendo 3DS (this of course includes units bought from Japan and shipped to neighboring countries). Worldwide sales of the Nintendo 3DS family was at 22 million as of September 2012 – I tried looking for an updated number to see how many units we’re sold during the holidays but couldn’t find a reliable source. With the influx of highly anticipated games like Monster Hunter 3 Ultimate and Pokemon X and Y around the corner, we can expect more 3DS units to fly off the shelves.